And we’ve named her Billie Jemima – born last month, ridiculously healthy and definitely on the larger end of the scale at 4.37kg. Don’t be fooled by the photo below though – this babe does not sleep. Ever. We’re all doing well though… and even with the hardships that come with a newborn, it really is such a magical time. I’ve been sewing/crafting a few things for her room – like cot and bassinet sheets, covers for the change table and a matching lamp shade (I did a course with The Handmakers Factory for the lampshade), but have on the whole been rather non-interested in sewing myself. Doesn’t stop the inspiration going through my head though… or the thought of being able to sew formal dresses for the little miss later down the line!! I’ll probably be silent on here for a little while longer… but I will be back. There are too many ideas floating around in my head for sewing projects for no come back. What an absolutely beautiful baby. Congratulations! I love the rabbit! 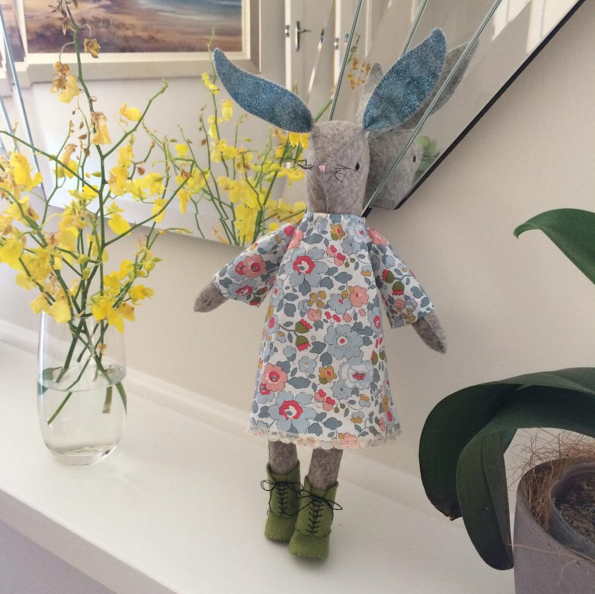 Thanks Meg :) That softie felt rabbit is a seriously divine pattern! Congratulations . She’s gorgeous. I have 2 girls (4 and 2) and sewing time gets greater the older they get, especially as they get excited about picking patterns and fabrics for their dresses and skirts. Congratulations! She is just beautiful. Congratulations and a warm welcome in this world to your lovely and sweet little daughter! Congratulations! She’s gorgeous. Sewing mini girly things…. what fun. How wonderful. I imagined that was the reason for your silence. I’m sure you are dreaming of little girl things that will be such fun to make. Congratulations and enjoy! Thanks Mary :) I’m really looking forward to sewing sweet little girly things! Congratulations to you! And many blessings to you little family! Congratulations, she is absolutely gorgegous. I made a Maggie rabbit (boy verson), for my first son too. Second son now sleeps with it each night. Oh lovely!!! It’s such a gorgeous pattern – I’ve got the Dandelion Deer one cut out and ready to go, but that will be a while to come now I think :P Thanks Andrea! Congratulations, gorgegous baby. Enjoy and hope to hear from you soon here!!! Thanks Joza – me too! A very hearty congratulations, Melanie! Is that Liberty I see peeking out from every corner? Love the yellow bedding and that bunny! A good friend of mine gave my DD1 a stuffed white bunny when she was born. She slept with it for years, and now it is in her treasure box. Congratulations, Melanie! And welcome to the world, Billie Jemima, you’re a beauty! This does not surprise me – you do have excellent taste ;) When I came across the name Billie… all other girls names did not matter! That was it. Congratulations! I hope young Nillie Jemima develops a sleep pattern before much longer, otherwise, you will become punch drunk from lack of sleep yourself. Lovely looking little one. Take care of yourself. I’m sure we’ll get there (eventually…), Karen :) Thank you! Congratulations! All the best to you as you begin this chapter. She is such a precious little one. Oh my goodness! What a sweetie-pie! Congratulations! It took me a while to get back into the swing of sewing for myself after Taco’s birth, and to even want to get back into the swing of it for that matter. It’s such a transitional and transformative time, those early days with your baby. I hope you are taking good care of yourself, too. She’s a beauty, just like her mama. Congratulations!!! Scratch that… I see them now… and both it and you look amazing! Love it!! Congratulations! Little girls are so much fun to sew for. What a beautiful little miss – and so lucky to have you for her mom! Sending you hugs and love across the many miles! Once you start, you just can’t stop ;) Thank Jenni! She’s beautiful, congratulations to you both! Thanks Lisa :) I really am enjoying it (apart from the occasional lousy moment where it all seems too much) and the fleeting part is already fleeting! Watching a person grow from scratch is quite the something, eh? Welcome to the world, Billie and congratulations Melanie! What a sweet little face. Congratulations! Such a beautiful baby! Enjoy. Congratulations! She is so cute. Enjoy! So beautiful. Your best creation yet! Yes I agree with you there :) I’m now getting used to this new normal, at any rate :) All is very well – apart from the odd/daily occasion where I feel like I’m losing my marbles! Congratulations on your adorable baby girl! Enjoy this special time! Thanks Sheryll – we are! Best. Make. Ever. She is adorable. Well done! Pretty much ;) Thanks Annie! Congratulations! She’s gorgeous! I’m glad to hear you’re all healthy and well. Congratulations!! She is beautiful! Yes, you’ll have lots of fun sewing for her, at all stages. Enjoy these specials times. So many congratulations! She’s beautiful <3 I know how chaotic things can be with a new baby (or even and older one haha)! Focus on her and come back here later! She’s so beautiful! Many, many congratulations. Enjoy your time with her….we’ll be here when you get back. Congratulations – that’s wonderful news! Love her name. I think that perhaps the nicest thing anyone said to me about my awake-for-23-hours-a-day new baby was that babies who are awake all the time are very, very smart, and just don’t want to miss anything. 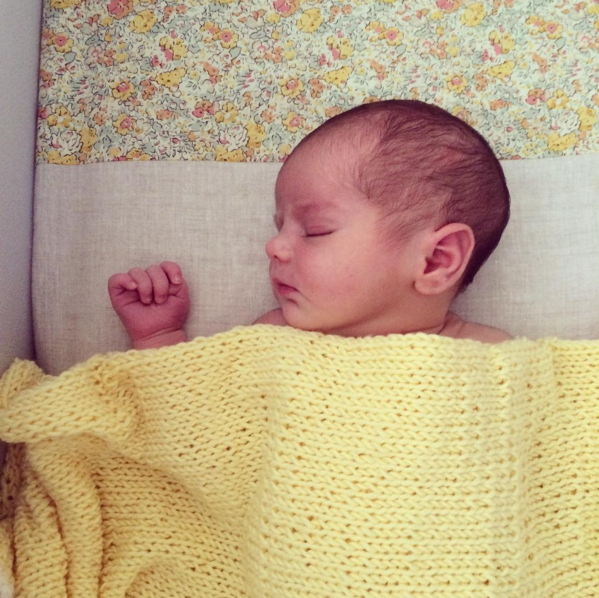 Wishing you much joy in your gorgeous baby and a sewing friendly nap or three. Thank you – I’m really looking forward to the sewing friendly naps! My eldest had a tee that said… sleep is for the weak. She still believes it to this day (now aged 9!). 😂 I may have to get one of those! If you want to keep your sanity, nap with her. Not nights, but naps. Thanks Mary – I’ve had to instigate the exact opposite to keep it together – now she-who-never-naps, comes for naps with me! try to enjoy as much as you can, and when you don’t enjoy, well, you’re just a human being! Gosh, what a beauty! Massive congratulations! Crossing my fingers that you’re able to get some rest! Congratulations and joy to your whole family. My babies didn’t sleep and both are very smart young women now. I’m a little late, but extend my heartfelt congratulations on the birth of your daughter. Hope all is going well! !